Clearing a MCTS Windows 7 exam, Configuring 70-680 Exam is not really that tough. You should always have a right channel to prepare yourself. There are many ways of preparing yourself for a Windows Certification exam. But you should always have a expert panel to train you and guide you through each and every phase of your preparation. uCertify is one of the most popular and well established company which is training thousands of students online. There are hundreds of paid Prepkits provided by uCertify every month to make your preparations go easy and quick. There are few points which you have to understand before knowing about uCcertify. One of the best feature of being a Ucertify member is, you can get back your prepkit money if you are not clearing the exam. Also you can prepare your exam where ever you want. Yes, this is possible in two ways. Which will be mentioned below. You might be wondering what exactly is this Microsoft’s 70-680 test ? Well, this test will validate your skills and knowledge to efficiently install, configure and manage the Microsoft Windows 7 desktop operating system. Specially in an enterprise environment, this is very much useful for you to show your skills. If you are appearing for this exam, you should have at least one year of experience in the IT field. Also you should have enough experience in implementing and administering any windows client OS in a networked environment. You can buy the advanced prepkit of 70-680 Exam from the uCertify site and start preparing the exam in the way you want. You can prepare your prepkit in both online interface or a downloadable client interface called as the Prepkit Engine. One of the main reason of making the prepkits available in both these interfaces is the flexibility. With this Prepkit Engine, you can open your any prepkit which you have bought earlier and make the best use of it. Once if you get your prepkit, you can use it any number of times to prepare for the MCTS windows 7 exam. The design interface of prepkit engine is modeled in four ways. Each of this module is very important in preparing your MCTS windows 7 exam. The prepkit engine consists of following sections. Each of this module will give you the best way of preparing your exam. Lets take a detailed look on how the Prepkit engine will help you to get through your MCTS windows 7 exam. If you are using the prepkit engine which you have downloaded from the uCertify site. Then you can see a option where you can upload your own exam kit which you brought. You can find out various practice test papers and quick assessment to determine the initial level of the exam. You can find 6 different types of exams with over 400+ questions and adaptive tests. Check out the below figure where you can also see that, when ever you are failing your exam, a thumbs down symbol is shown that you are not ready for the exam yet. You can also create a custom test on your own to find out your weaknesses and turn them into strengths. Also you can create a fixed time test according to your time table. Here you can find out what exactly the prepkit covers in the topic. You can find the exam essentials in any easy and a structured sequence. The whole syllabus in covered in this study helper part. Where you can find out what exactly is the next upcoming topic is. You can find out the list of topics which you have to understand before appearing for the exam. Take a look at the picture, which will show you the exact way of presenting the study helper channel to you. The most important part of your preparation takes part in this section. The study material section will allow you to find out key areas and skills you will be tested in the exam. You can learn a lot from the study materials and articles mentioned in this section. 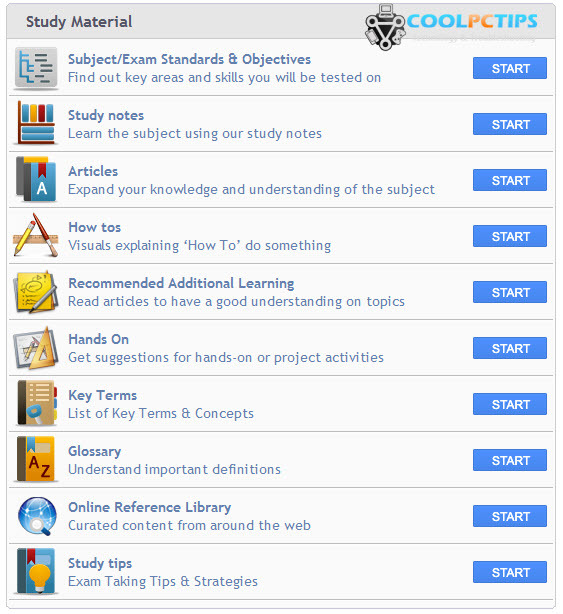 You can find a lot of tools like, How to articles, Recommended additional learning topics, hands on topics, Key terms, glossary, online reference library and other study tips. You can start any one of them for making your exam simpler and faster. In the final section, you can track your progress on how far you are prepared for the exam. You can check each and every test history to review your performance. You can continue to take practice tests until you score 95% of the marks in the mock tests. The final objective readiness report will tell you how far you are ready for the exam to appear. Check out the below picture to know how exactly the interface look like. If you really want to experience the real enjoyment of preparing yourself with uCertify prepkit, you can always try the demo version and get a better learning experience in a quick and a simpler way.If you got any doubts on clearing the MCTS windows 7 exam, Configuring [70-680] Exam, you can always write down to us. Please leave a comment if you want to know more about uCertify prepkits. All the best with your MCTS windows 7 exam.